Workforce WindsorEssex has launched a new and improved mapping tool called WEmap jobs that makes the process of finding your next job easier than ever. The new website jobs clusters job postings geographically and re-distributes them to their street address as you zoom in. 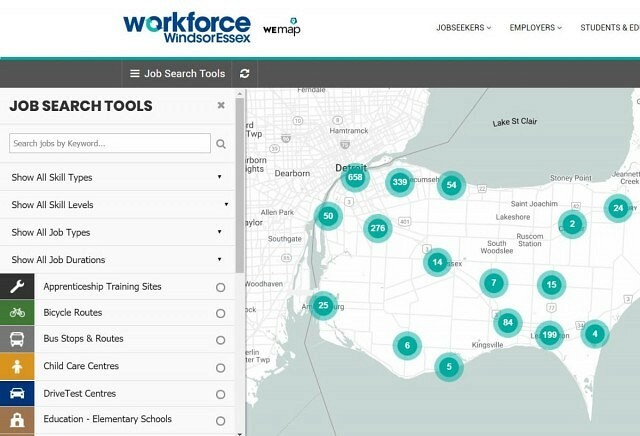 It also has unique search tools that allows users to find jobs and connect with up to 18 related services such as apprenticeship training sites, bicycle routes, bus stops and routes, childcare centres, drive test centres, schools, employment services, language training, literacy and basic skills training sites, as well as key offices such as Ontario Disability Support Program, Ontario Works, Service Canada, Service Ontario and Ontario’s local Apprenticeship office. With this tool, a user can search for a job posting with a key word search or an occupation filter and get walking, transit or driving directions to that location. The same user can toggle relevant services on/off, such as child care or language training centres, to see what’s available along their commute. The WEmap jobs tool is available in 104 languages. You can find the website here.